Del Mar City Beach is comprised of three sections. Those areas include North Beach, Main Beach and South Beach. With certain guidelines, dogs are permitted in all three Del Mar Beach areas. This a real convenience for San Diego residents and tourists who travel with their dogs. As the name implies, North Beach is at the north end of Del Mar City Beach and permits dogs all year. The area is located just north of the beach houses at the mouth of San Dieguito Lagoon which acts as a barrier that separates Dog Beach from the Main Beach. The specific location is from 29th Street to the south border of Solano Beach. June 15th through Labor Day. Dogs must be on leash. Day after Labor Day through June 14th. Dogs may run unleashed but must be under voice control. Parking is available along the street with a small fee. Free parking is available a bit south of the beach where houses begin along the highway. This is a great place to observe the San Diego Fair and the fireworks on July Fourth. The Main Beach is located from the north end of Powerhouse Park to 29th Street which is where Dog Beach begins. June 15th through Labor Day. Dogs are prohibited. Day after Labor Day through June 14th. Dogs must be on leash. South Beach is located south of Powerhouse Park to the Torrey Pines border at 6th Street in Del Mar CA. Dogs are permitted on leash year-round. 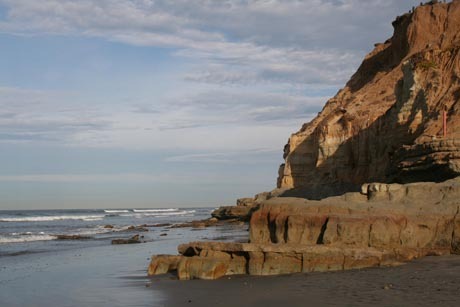 The beaches of Del Mar are about twenty miles north of Downtown San Diego. The area is upscale and gorgeous. Torrey Pines State Beach lies on the southern edge of Del Mar and includes the Torrey Pines State Reserve on the bluffs above and a fantastic stretch of beach below. The beaches of Del Mar stretch for 2 and a half miles. Del Mar no longer allows fires or glass on their beaches. Beach access is free in most cases and public restrooms are provided at some of the beaches. The beaches at 17th street and 25th street have restrooms behind the lifeguard towers. The beaches in Del Mar CA tend to have more local residents and a laid back attitude versus the more touristy beaches further south. The water and sand are perfect on a hot summer day with plenty of room to stretch out. Surfing, swimming, boogie boarding, beach combing, jogging, dog walking and castle building are all popular activities. A unique experience that Del Mar CA is known for is a hot air balloon ride at sunset over the ocean. Whether you’re in the hot air balloon above, or on the beach below, it’s a gorgeous sight to behold. Many hot air balloon companies offer rides and are based right in the charming town of Del Mar.